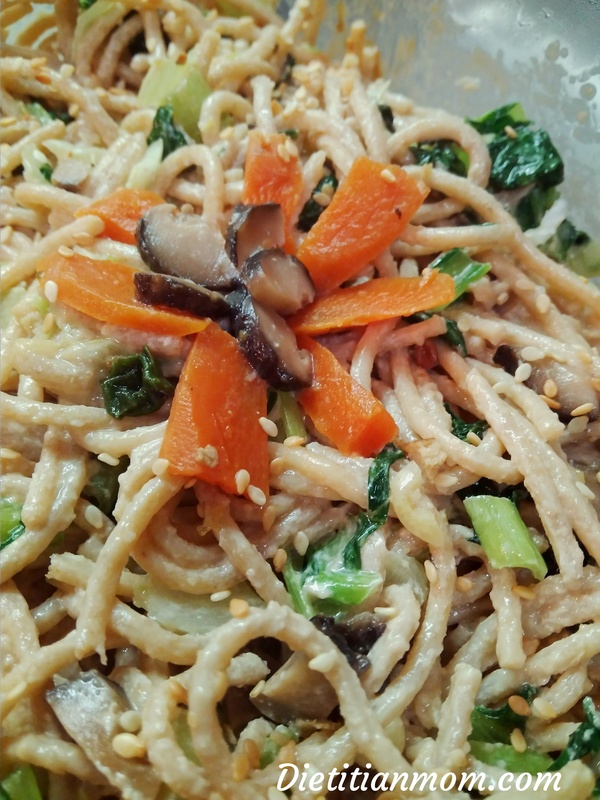 These vegan, egg-free and dairy-free Asian Tahini Noodles are quick to whip up for lunch or dinner for the whole family. It only involves a few simple steps and works with any kind of whole wheat pasta you would like to use. Tahini is a paste made from sesame seeds so it’s a great source of nutrition to add to noodles. Sesame seeds are really nutritious little seeds. About 3 tablespoon’s worth (one ounce) of sesame seeds provides almost 5 grams of protein, nearly 5 grams of fiber, 2 milligrams of iron and close to 3 milligrams of zinc. They are also good sources of polyunsaturated and monounsaturated fatty acids. Vegan, egg-free, dairy-free, nut-free protein-rich noodles that make a satisfying meal. Cook whole wheat pasta according to package instructions. Wash, chop and steam or stir-fry any vegetables you would like to add to this dish. Mince the garlic and mix together the sauce ingredients. Mix sauce with 2 cups's worth of whole wheat pasta noodles. Garnish with sesame seeds (optional)! You may add tofu cubes and/or cooked beans to this dish to make the recipe even more protein-rich. This recipe makes 3 tablespoons of sauce to coat 2 cups of cooked whole wheat noodles, but feel free to make a greater quantity of sauce if desired. Use any kind of noodles you would like, such as buckwheat noodles, rice noodles or whole-wheat pasta noodles! Some children may find the minced garlic 'too spicy'. If this is the case, simply omit the minced garlic from the recipe. The dish can be as simple or complicated as you want to make it. 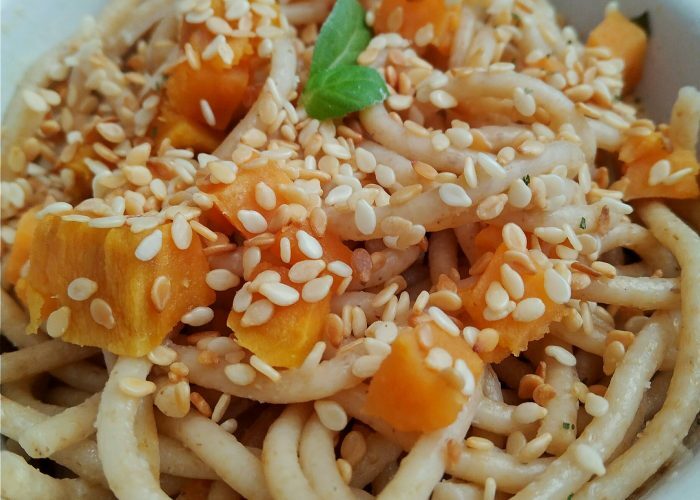 You can just serve the noodles as pictured with some steamed or roasted sweet potato cubes and toasted sesame seeds sprinkled on top. Or you can choose to add in a variety of stir-fried vegetables and boost the protein content further with cooked black beans, tofu or soy beans (edamame). Feel free to add in any kind and amount of vegetables you like. Examples include stir-fried or steamed green leafy vegetables, bean sprouts, green beans, steamed/baked/roasted sweet potato chunks, Shitake or cremini mushrooms, carrots, baby corn, diced zucchini, cabbage or even eggplant chunks. The dish was delicious when I added in some carrots, leafy greens and shitake mushrooms…with of course, toasted sesame seeds on top! Sounds amazing and I will have to make it soon. Thank you very much. I love the zoomed in photo on this post!